The Forecast feature in OmniFocus 2 provides a convenient way of seeing what's coming down the pipe. How to view all due and overdue items in your OmniFocus database. How to view due items for a specific date . How to view a list of due items spanning continuous and non-continuous dates. How to view deferred items in the forecast view. How to change defer and due dates through drag and drop. How to display some or all of your calendars in the Forecast view. How to display deferred items for a specific area of life (requires OmniFocus 2 for Mac Pro Edition). 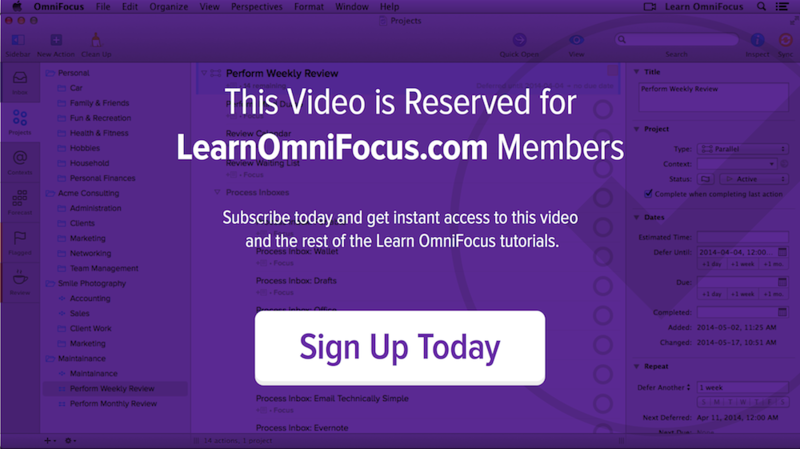 To help ensure that you're using due dates effectively, it's recommend that you read the Best Practice: Use Due Dates Sparingly article here on Learn OmniFocus.